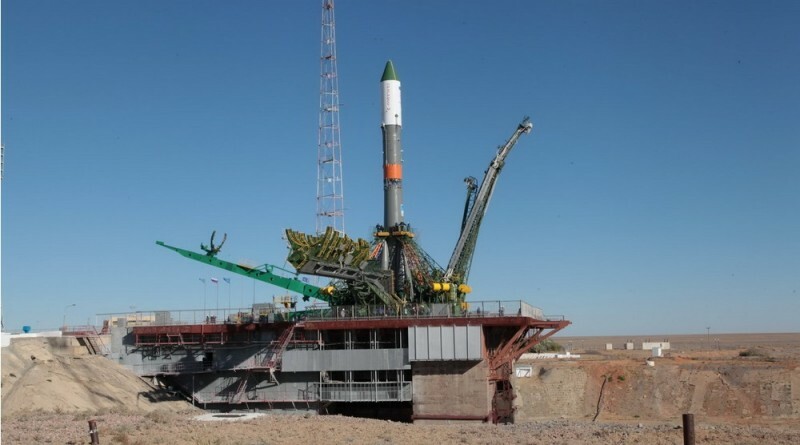 A Soyuz rocket was rolled to its launch pad at the Baikonur Cosmodrome on Tuesday for Thursday’s planned liftoff with the Progress M-29M spacecraft, set for a resupply mission to the International Space Station. Filled with over 2,300 Kilograms of cargo, Progress M-29M aims for blastoff on Thursday at 16:49 UTC to enter a low orbit in which it can catch up with the International Space Station for a six-hour express flight to the orbiting outpost. Progress M-29M is the final spacecraft of the M-M class to launched, to be succeeded by the improved Progress MS vehicle that will enter operation with its first launch in November. The MS series of Progress spacecraft continues to use the well-proven Progress design that dates back to the 1970s and has undergone continuous improvements and modifications over the years, introduced as part of incremental upgrades. The MS upgrade focuses on a number of systems, in particular the communications system, flight control software and proximity navigation system. The upgrade in the Progress line of vehicles is also used to demonstrate the new technologies in an operational environment before committing the crewed Soyuz to the same changes with Soyuz MS currently expected to make its first launch in March of 2016. Preparations for the Progress M-29M mission were initiated at the Baikonur Cosmodrome with the arrival of the spacecraft to undergo processing at Site 254 where the craft underwent detailed checkouts and testing operations before the bulk of cargo was loaded into the pressurized compartment of the craft. The Progress also received water and pressurized gases that will be delivered to ISS. Progress was fueled for flight two weeks ago. Last week, the Progress was attached to its payload adapter, completed final inspections and was encapsulated in its protective launch shroud to be ready for the transfer to the launcher assembly hall. 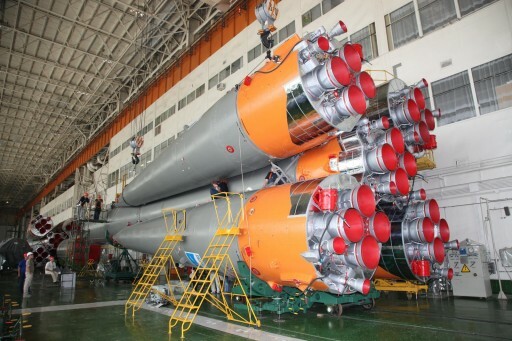 The Soyuz U rocket began its integration inside the MIK processing facility in the last week of July when the 27.8-meter long core stage had its four liquid-fueled boosters installed. 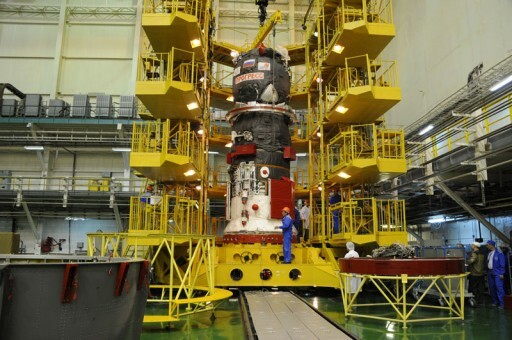 When the enshrouded Progress craft arrived at the facility, it was attached to the Block I third stage of the Soyuz rocket before the stack was installed on the Core Stage to finish the assembly of the rocket. The Russian State Commission met late on Monday to confirm the readiness of the launch vehicle, spacecraft and ground systems for the rollout of the rocket at the traditional early morning hour. 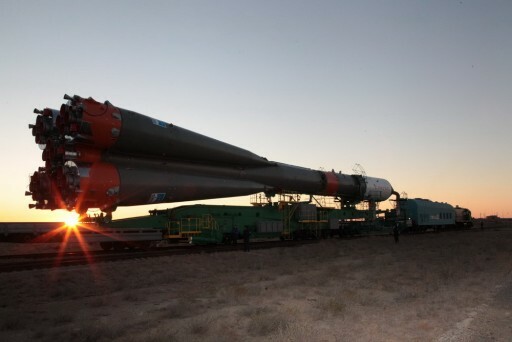 Soyuz U emerged from the assembly facility at 6:30 local time to begin its trip to the launch pad before sunrise. Rolling atop rails, the Soyuz U saw a colorful sunrise before arriving at the historic launch pad at Site 1/5. At the pad, Soyuz U was placed in its vertical launch position to enable the two halves of the Service Structure and the umbilical towers to be moved into place. Over the two-day on-pad campaign, the Soyuz rocket is readied for countdown operations by connecting the various interfaces to ground systems and putting the entire vehicle through a series of integrated tests to confirm all subsystems are ready to support the mission. Aiming for a late night launch, local time, teams will initiate countdown operations on Thursday, about eight hours prior to the planned launch time. The procedure starts with the activation of the Soyuz rocket and Progress spacecraft for a last round of checkouts and reconfigurations. Communication checks, electrical testing and propulsion system checks will be wrapped up in the early phase of the count and technicians will be busy at the launch pad, performing the final hands-on tasks, specifically installing flight batteries on the launcher, removing protective covers and closing out the rocket and Service Structure. The Russian State Commission convenes five hours ahead of launch for their final pre-launch meeting that includes a review of launch vehicle test results and a check of countdown progress to provide the formal approval for propellant loading. 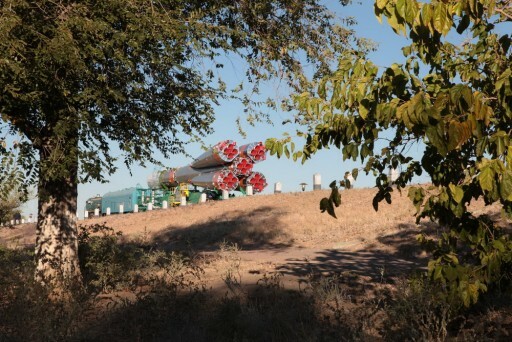 The tanking cars will pull up to the launch pad to be connected to the propellant ground systems in order to be able to feed Liquid Oxygen and Kerosene to the 12 tanks of the rocket. Propellant Loading commences about four hours prior to T-0. In a procedure lasting around two hours, the four boosters, large core stage and Block I third stage will receive 272,200 Kilograms of propellants, plus liquid Nitrogen that is fed to the boosters and core stage to be used in flight to keep the tanks at pressure. Tanking will be completed inside T-2 hours, allowing the team to begin the final configuration of pad and launch vehicle. In the last hour of the count, Soyuz will activate its guidance system and receive the flight parameters calculated for this mission. The retraction of the service structure will reveal the rocket on its pad, its tanks iced over due to the supercold LOX inside. Progress will make its transition to internal power to be ready for its launch into orbit. The Automated Sequence of the count picks up at T-6 minutes and includes the final steps to put the Soyuz in its autonomous launch configuration. As part of a highly choreographed sequence, Soyuz will purge its engines with Nitrogen to ensure a clean ignition, pressurize its tanks for flight, switch to internal power and assume control of the final minute of the count leading up to ignition sequence start at T-20 seconds. When clocks hit zero at 16:49:40 UTC, Soyuz U will leave the pad with a total thrust of 422 metric ton-force supplied by the four RD-117 engines on the boosters and the RD-118 core stage engine. After a short vertical rise, Soyuz will begin to pitch over, departing Baikonur to the north-east, chasing down the Space Station that will pass over the launch site just minutes prior to blastoff. Heading uphill, Soyuz passes the speed of sound and experiences Maximum Dynamic Pressure just a minute into its flight with the boosters doing most of the work to accelerate the rocket. Shutdown and separation of the boosters is expected at T+1 minute and 58 seconds after each burned though 39,600 Kilograms of propellants to send the Soyuz on its way. Departing the rocket, the four boosters will be pushed outward and begin their tumble back to Earth for an impact 350 Kilometers from the launch pad. Relying on its core stage alone, Soyuz will continue its trip into orbit with a total thrust of 94 metric ton-force. The protective payload shroud will separate at T+2 minutes and 41 seconds when the stack will be pushing through 85 Kilometers in altitude where the air is sufficiently thin to allow Progress to be revealed. Shutdown of the core stage at T+4 minutes and 45 seconds marks the start of the hot staging sequence employed by the Soyuz. Two seconds after shutdown, the Soyuz will command the RD-0110 engine on the third stage to ignite followed moments later by the firing of separation pyros that cut the connection between the stages so that the third stage can head on to orbit and the core is sent towards re-entry and a crash landing 1,500 Kilometers downrange. The 298-Kilonewton engine will fire for three minutes and 58 seconds aiming for an insertion orbit of 193 by 245 Kilometers at an inclination of 51.66 degrees at a phase angle to the ISS orbit around 30.4 degrees, permitting this flight to use the expedited rendezvous profile. 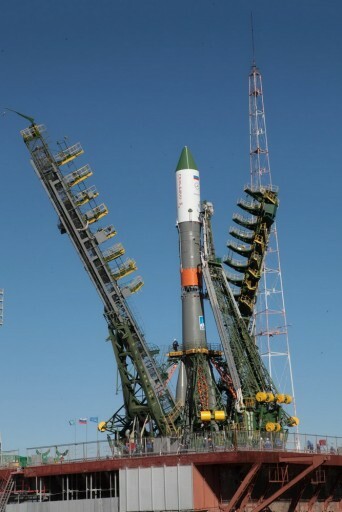 Separation of the Progress M-29M spacecraft is expected eight minutes and 49 seconds after launch to mark the start of a series of time-tagged commands that will deploy the craft’s solar arrays and KURS navigation antennas followed by the transition of the vehicle to orbital flight. Sticking to the fast rendezvous profile, Progress M-29M will conduct two engine burns on its first orbit around the Earth that were pre-programmed prior to launch. Insertion errors will be corrected on the second orbit when another pair of burns is performed to put the spacecraft in the proper position for the initiation of the Automated Rendezvous Sequence at 20:45 UTC. 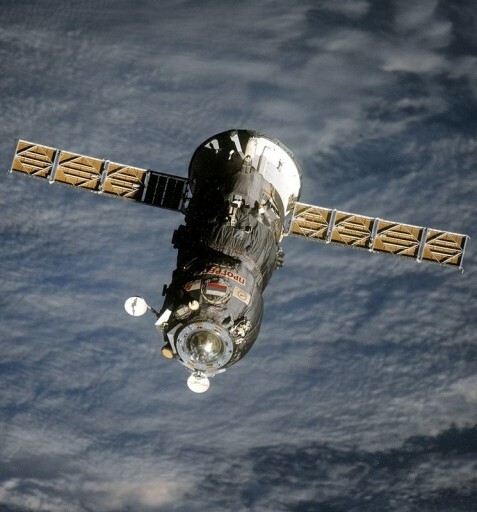 Over the course of the automated rendezvous, the Progress performs a series of engine burns guided by its KURS navigation system to link up with ISS for a flyaround followed by Stationkeeping and final approach to the Zvezda module for docking at 22:54 UTC.